A traditional Vietnamese celebration commemorating the country’s ancestry and founders was held in Vientiane, the capital of Laos, on Saturday, helping spread the culture and traditional values of Vietnam, according to the Vietnam News Agency (VNA). The Hung Kings’ Festival is annually observed on 10th day of the third lunar month, which officially falls on April 15 this year. Officially known as Gio To Hung Vuong, literally meaning “Death Anniversary of the Hung Kings," the celebration honors the Hung Kings’ contributions to the country as founders of the early nation state known as Van Lang, originating between 1,000 B.C. to 500 B.C. With a traditional ceremony, the national holiday of Vietnam was celebrated in the capital of Laos on April 6, a week ahead of the official celebration, thanks to the cooperation of several Vietnamese organizations and the Embassy of Vietnam in Laos. Contributing to the success of the traditional event were the association of Vietnamese people in Vientiane, a city-level association of Vietnamese in Vientiane, and an association for Vietnamese businesses and investors in Vientiane, among others. Nguyen Phu Binh, Ambassador of Vietnam to Laos, formally handed the statues of the Hung Kings to the head of the association of Vietnamese people so that Buddhist monks could start the traditional ceremony. 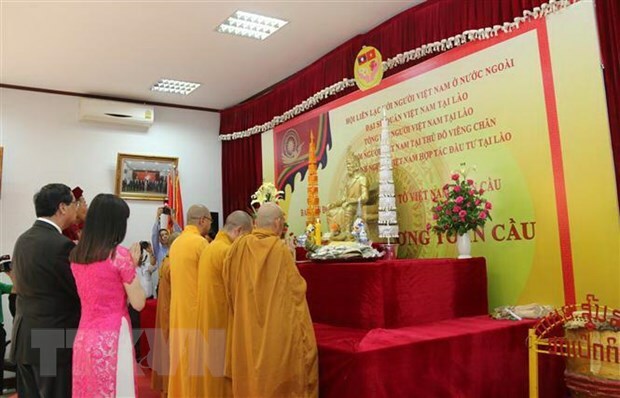 Monk Thich Minh Quang, head of a department for the management and cooperation of Vietnamese Buddhism in Laos, chaired the traditional ceremony, according to the Vietnam News Agency. During the ceremony, representatives of Vietnamese associations, departments, and organizations in Laos had the opportunity to show their respect for while offering prayers and incense to their ancestry. The ceremony significantly contributed to spreading Vietnamese culture, traditions, and the religious practices of worshipping ancestry in the neighboring country. For the Vietnamese community in Vientiane, being able to celebrate one of the major traditional holidays of Vietnam in another country was a sacred and touching opportunity. Being organized outside of Vietnam, the celebration commemorating the first kings of the country deeply reminds Vietnamese living abroad to remember their roots and always feel grateful to their ancestry. The event also played an important role in closing the cultural gap between Vietnamese and Laotians as it helped the Laotians better understand Vietnamese culture and practices, contributing to the good diplomatic relations between the two countries.